The Ultimate3 25kW System gas boiler is a highly reliable boiler that boasts a wide variety of features and benefits and comes designed and manufactured by Glow-worm. This is a highly efficient unit that comes with an efficiency rating of 89.7% and an ErP A rating which will help save you money on your energy bills. 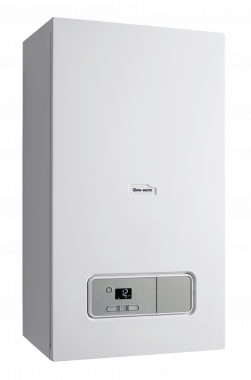 Having an output rating of 25kW, the Ultimate3 System boiler is perfectly suited to larger homes with more than 1 bathroom that have a high demand for heating and hot water. As a compact unit that comes wall mounted, it will help save valuable space around the home. Despite its size, the Ultimate3 unit still houses lots of features such as an automotive grade aluminium heat exchanger to offer high performance, a Grunfos modulating pump to help reduce energy usage and save you money, a bright LCD display with easy to use interface, an inbuilt filling loop to help for straightforward maintenance and full compatibility with Glow-worm’s MiGo app to give you control over the unit from your phone. With this being a System boiler, it sends hot water to the radiators and a sealed hot water storage cylinder. The important parts of the system are built into the boiler which makes it more compact and easier to service. Featuring a 5-year warranty, you’ll have the peace of mind that this boiler isn’t going to let you down.